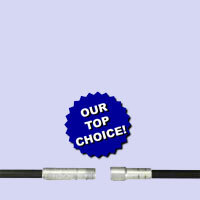 Our Professional 59F Black Fiberglass Chimney Cleaning Rod is our "Top Choice" in cleaning rods. They are .440" in diameter and they come in 4', 5', and 6' lengths. All lengths have a 3/8" male pipe thread on one end and female on the other end. These rods will last you your lifetime. They are flexible enough to turn 45 degree bends in your chimney, but rigid enough not to flop around and bind in your chimney.